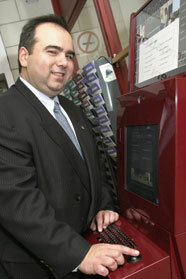 Michael Di Grappa, Vice-Rector Services, demonstrates how to use a new information kiosk. With the introduction of 10 new information kiosks throughout both campuses, students will soon be able to speak with a representative at the Information Desk via a webcam. Once microphone installations are completed in the next few weeks, Concordians will no longer have to make the trek to the Hall Building to get their questions answered. The kiosks will allow both the Information Desk representative and the student to see an image of each other while speaking. “The kiosks make it simple to get student information,” said Candice Dandurand, a third-year Journalism student. She noted that it wasn’t always easy to find information in the different buildings. The new burgundy kiosks will continue to give users access to Concordia’s home page (http://www.concordia.ca), as well as their personal portals (http://www.myconcordia.ca). This allows students to verify a wealth of information, including exam schedules, the shuttle bus schedule and grades. Other options include course registration and payment, as well as locker selection. Dandurand said she likes the fact that the kiosks can be found whenever you need them. “If I forget my schedule the first week of school, the kiosks are there to check courses or any other information I might need,” she said. The kiosks are part of the philosophy of the Service 1 initiative, introduced by Vice-Rector Services Michael Di Grappa — aimed at delivering excellent service to every member of the university community. “These kiosks are part of our ongoing commitment to improve the quality of services for students, faculty and staff,” said Di Grappa. He stressed the importance of putting essential information and services at the fingertips of students, as well as providing a service that can be accessed between courses and at odd hours. “We want our services to suit the students and their schedules. Our goal is to make it easier for them to obtain quality service – anywhere and at anytime,” he said. The university will boast a total of 19 kiosks across both campuses (including the blue model installed in 2002) after four more kiosks are added by next term. For questions regarding kiosk use, please contact the Helpline at ext. 7613 (Monday to Friday, 7 a.m. to 11 p.m.) or send an e-mail to help@concordia.ca. Anne-Marie Curatolo is IITS’ Communications Coordinator.